It’s a positive close to the Obama economy. It marked the 75th consecutive month of job gains, the best on record. For all of 2016, the U.S. added over 2 million new jobs. “Today was a positive close to the eight years of the Obama administration,” says Andrew Chamberlain, chief economist at career website Glassdoor. Wages grew a solid 2.9% in December, the best pace since 2009. Wage growth has been one of the last measures to gain momentum during Obama’s tenure. Job gains in November revised up significantly, adding 19,000 more jobs than first reported. America’s job market has made progress under Obama’s watch. U.S. unemployment hit a high of 10% in October 2009 and is now at less than half that level. In December, the unemployment rate rose just a tad to 4.7% from 4.6% in November, the lowest rate since 2007. 15 M private Obama jobs, 2/3 created by the BHO44 Dem $100 B per year 5 year stimulus. President Obama’s hat could never be big enough to hold all of his accomplishment sticky notes though. rump will have one sticky note listing his accomplishment, “I tweet while I am on the toilet”. Thanks for making me LOL! I don’t do that as much as I used to. Trump’s big achievement will be quadrupling the federal deficit! Wow! He’s a multi-tasker! He can tweet while crapping. Now, THERE’S a trait needed to be an excellent POTUS! I would have loved to have been a political cartoonist. I certainly know how to garnish my beliefs with the required amount of sarcasm and irony. Unfortunately, the average 2nd grader is a much better artist than I am. I GUESS THE DOCTOR WAS RIGHT. i WAS SICK AFTER ALL. Now if only I could draw…. My Dad took some drawing classes after he retired. His teacher ended up being my middle school art teacher, so I don’t know how old she must have been at that time! I sucked at drawing when I was in her class, but my Dad was much better. I say “go for it.” You may surprise yourself. Our son’s good friend’s brother was great at drawing caricatures and had your gift of political sarcasm and being able to point out irony. He is now the political cartoonist for the Buffalo News. He took over for Tom Toles. He’s very good. You never know where your interests might lead you! Well you are not being fair, rump saved 700 robots their jobs lol. And Ford Motor Company is bringing in even More Robot Jobs to replace human workers. You forgot saving the auto industry – and keeping us safe for 8 (count ’em: 8) years, unlike Bush who allowed the US to be attacked, then bragged he kept us “safe” for the remaining 7 years. The wage number is the impressive one, we will not see this gain again soon. 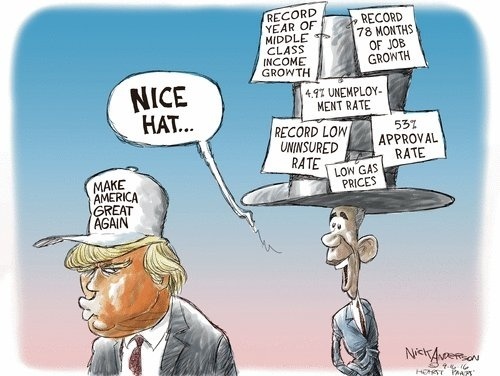 tRump is never going to beat President Obama’s economic record of achievements. And by that standard he will never make America great again. Actually the jobs number is a little low, lower than expectations…(will trump take credit for that)?…. But mark my word, Trump will take credit for the uptick in wages..
Didn’t Mitt ‘the Sh*t’ Romney promise to do this by 2050? Trump will take the Credit for that, Thank You. He got Elected so He owns IT. So says the ” Yellow Haired Wonder “.